Off the Page is a regular interview series produced by the National Magazine Awards Foundation. Today we catch up with Byron Eggenschwiler, five-time National Magazine Award-winning illustrator whose work has been published in Swerve, Maisonneuve, Cottage Life, Canadian Business, Up Here and other Canadian magazines. NMAF: You call Alberta home and graduated from the Alberta College of Art + Design. Like so many other graduates of programs at ACAD and the Ontario College of Art and Design, you’ve found great success in the Canadian magazine industry. How has your education helped shape your art and your future as a magazine illustrator? Byron: My education was pretty invaluable, it gave me an environment that encouraged exploration of media and ideas and forced me to sit down and start thinking about the kind of work I wanted to make. The program at ACAD was really great for teaching us about both design and illustration and how the two intersect. Having both those backgrounds has been helpful in my illustration work. I actually didn’t even know illustration was a career or what it really meant until going through the program. I was lucky to have teachers who encouraged me and steered me in the right direction and some really talented friends in my classes that challenged me to push myself out of my comfort zone to make better work. “Be Worried–Don’t Be Happy” by Byron Eggenscwhiler (Swerve). Gold Medal, Spot Illustration, 2008. NMAF: A year after winning your first NMA for Spot Illustration in Swerve for “Be Worried–Don’t be Happy” in 2008, you were the first-ever winner of the award for Best New Visual Creator [now known as Best New Illustrator or Photographer] for “Tales from Riverheights Terrace” (also in Swerve). How did this recognition help propel your career? Byron: I am unsure how these things directly affect future work but it helps to get your name out into the world a bit more, which can’t hurt. It is a great event celebrating the Canadian magazine industry and an honour for me to be acknowledged for the work I am doing within that [industry]. It gives a guy a confidence boost to keep moving forward in an otherwise fairly solitary profession. NMAF: You have a distinct and recognizable style. How much direction do you take from your clients in the magazine industry and how much of your own creative voice goes into designing your illustrations for each piece? Byron: It can be a balance and depends on the magazine itself, but sometimes an art director has something specific in mind for an idea and I work with that. Sometimes that can be a jumping off point for an even better idea. There are times where there is a bit of back and forth along the way but most of the time it is left in my hands to see where I can take a piece and how I want to finish it. Compromising is part of the job and hopefully no matter what it still carries a bit of me with it at the end. “Death of the Salesman” by Byron Eggenschwiler (Canadian Business). Silver Medal, Illustration, 2011. NMAF: Many of your pieces seem to be more of an article within an illustration as opposed to an illustration meant to accompany an article. How does conceptualization for some of these, more image-heavy, pieces work? Byron: I start by distilling an article down to a core point or phrase and then start sketching whatever ideas come to mind with that theme in the back of my mind. I don’t tend to have too many thoughts until I can see the forms taking shape on the page and it is somewhere in that mental wandering and playing around that ideas will emerge for me. Depending on the feel of the story itself this can lead off in different directions, and as long as that initial idea is still there I am pretty open to anything. I like the idea of creating a new story with my illustrations to tell the author’s story. I think it can add another layer to the article and enrich it. NMAF: When drawing, do you aim to create an image that contextually matches the text of the article, or does the tone or theme of the piece dictate what imagery will accompany it? Byron: I like to read an article a few times to get an overall feel for the content and then decide how I want to approach it. If the tone is more serious or if it is humorous it will have a big influence on my thinking of how to approach the piece. I find the end result is much better if I can keep myself open to surprises through the sketching phase and let thoughts show up no matter how out-there they are. I try to make work that captures the feeling you get when you read the story and will speak to you with or without the text. 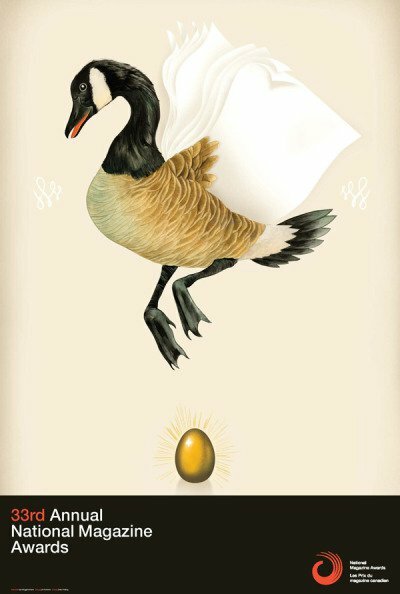 Byron Eggenscwhiler is an award-winning illustrator based in Calgary. His work has appeared in The New York Times, Wall Street Journal, Discover, More Magazine, BusinessWeek, National Post, O, The Oprah Magazine, LA Weekly, Canadian Business, Swerve, Runner’s World, Wired, The Walrus, Maisonneuve, Quill & Quire, Uppercase Gallery, Little, Brown Books for Young Readers & more. See more of his work at byronegg.com. Special thanks to Melissa Myers for conducting this interview with Byron for the NMAF. Read more about the National Magazine Award for Best New Illustrator or Photographer. Byron Eggenschwiler created the image for the 33rd annual National Magazine Awards gala in 2010.